When they say significant, they mean varied, and for starters much of that derives from the nature of the island. To the north, you have the Intracoastal Waterway while to the other side, you have the Gulf Shore. And in between, you have habitat that varies from grassland and small stands of oaks to ponds lavished with reams of cattails. 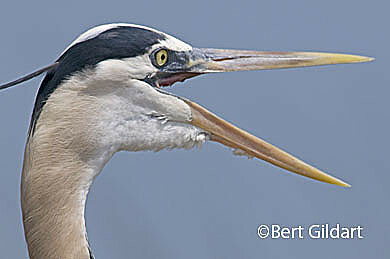 With so much crammed into this 70-mile long island, it is little wonder that Padre attracts over 350 species of birds. But there is more: The Western Hemisphere Shorebird Reserve Network and its governing Hemispheric Council has designated Padre Island National Seashore (PAIS) as a member of the existing binational Laguna Madre Site of International Importance to shorebirds. WHSRN is a world-wide organization encompassing 66 sites in 9 countries and to become a WHSRN site of International Importance, a site must, according to the Padre Island website, “contain over 100,000 shorebirds annually or at least 10% of a shorebird population. Among the impressive shorebird counts that led to the designation are those of 588 Piping Plovers… and 373,000 Western Sandpiper…” made several years ago. Certainly, those are some pretty impressive numbers, but those huge, massive, numbers are highly seasonal in nature, and for those of us drop-in visitors we also like knowing we can witness grand moments in nature. Padre has those, too, which we saw the other day with the Eggenbergers. Together, we saw the big and beautiful Crested Caracara, a species the Eggenbergers see almost every day they conduct their tour, which begins in November and generally runs through May. Well, no, we’d never seen it before, but with its long white neck and reddish-orange face, the Crested Caracara is a bird we’d not forget. That observation was just for starters. Joining George and Mary is one of the better things we’ve done while at Padre. In the course of a few hours, we tallied over 30 different species of birds. 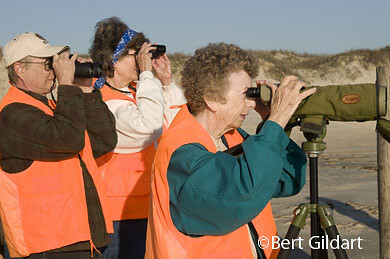 Many, of course, were more common than others, but still, we learned a great deal about locating a bird quickly by habitat, information I put to use in assembling a portfolio of birds of Padre Island. While here, I’ve managed to photograph about ten species and some with excellent results. One such species was the Great Blue Heron, and though I have photographed it in many parts of the country, never with the wind helping the bird flare some of its feathers, as in the accompanying photo. And never with the GBH creating such an animated croak, croak, as the one seen here with its gaping mandibles. 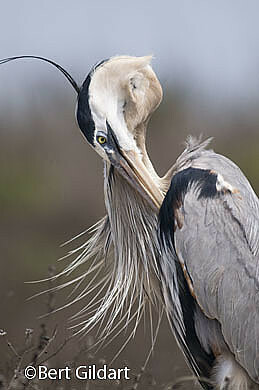 Preening Great Blue Heron, one of my favorites, taken with 600mm Nikon lens. Wind is flaring the feathers. 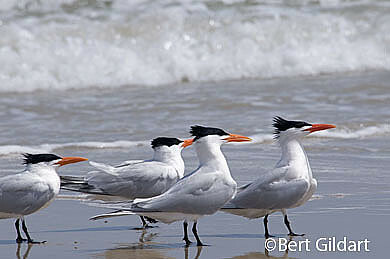 Another species I have pursued is the Caspian Tern, and I wanted it set against the ocean, with waves about to crash. I made this photo several days ago while driving the beach noted in my posting on pollution. Certainly not all portions of the beach are polluted, and we found this group in one of those areas. It’s also where I found an immature Laughing Gull attempting to steal a morsel held by an adult. Padre Island offers much to see and do, and we’ve enjoyed other activities as well. But for many, it will always remain memories of birds such as the Crested Caracara, the “squadron” of pelicans… the wind flaring the feathers of the Great Blue Heron-and the sight of thousands of Western Sandpipers darkening the skies over the Laguna Madre (Mother Lagoon) that linger longest in our collective memories. This entry was posted on Thursday, April 2nd, 2009 at 5:09 am and is filed under National Lands, Natural History/Conservation, Photography, RV Travel, Travel. You can follow any responses to this entry through the RSS 2.0 feed. You can leave a response, or trackback from your own site. Great photos Bert! Looks like you guys have landed in an interesting spot!!! Hey, saw where you were last year. Point of Rocks, eh?